All freelance teachers have to pay into the public pension fund, whether or not they have their own private pension. This amounts to 19.5% of gross income before tax and must be paid on all teaching income if this amounts to over €400 per month (averaged across the year). It doesn’t need to be paid on other freelance income eg: translating etc. One exception is if you pay employer contributions for one other person. If the DRV (Deutsche Rentenversicherung) requests you to pay this, there is a statute of limitations whereby they can backdate contributions but only up to 4 years. Only in cases of ‘hardship’ is this backpayment waived. If you get a bill for back payment, you can contact a social insurance lawyer. If you have paid into it for more than 5 years, you are entitled to a German pension and if less than 5 years, the money can be transferred to another EU pension scheme. However, there was some discussion about whether or not you receive the full amount of benefit, or a reduced benefit, in these situations. This is still only a draft plan. The idea behind it is that all freelancers (regardless of profession) would be obliged to have pension coverage, either public or private. However, there is a question as to whether teachers would be allowed this choice, were the new scheme to be introduced. There is a rule whereby if freelancers work more than 80% of their time with one employer, they are considered to be “scheinselbstständig” (ie: not really self-employed) and their ‘employer’ must pay pension and other contributions for them. Many teachers are warned by schools not to work more than 80% of their time with them. 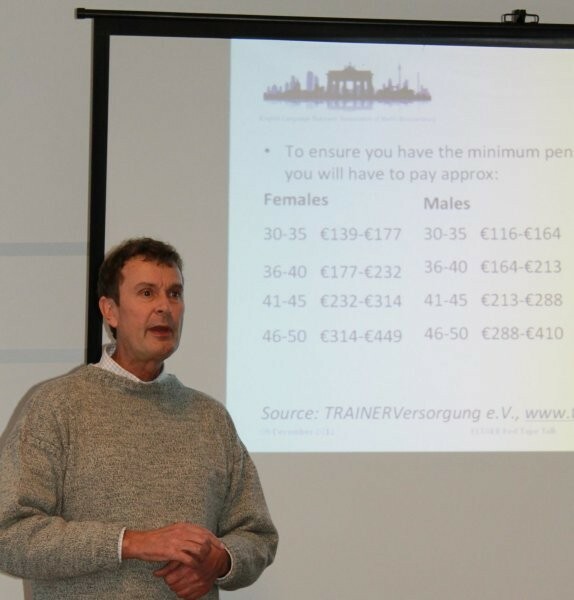 However, it would seem that this is based on misinformation as the DRV have confirmed a number of times that freelancer teachers cannot be “scheinselbstständig”, seeing as they are covered by different pension rules. You need health insurance in Germany, including ‘Pflegeversicherung’ (insurance in the case that you need to be cared for at any stage of your life). The only expat schemes the group was aware of that include this ‘Pflegeversicherung’ are ALC Health (A La Carte) and Allianz Worldwide Care. Most freelancers take out private health insurance but if you do so, it is almost impossible to decide afterwards to switch back into the public health insurance scheme. Public insurance is based on income, and private income is based on age, so private schemes are cheaper when you are younger but work out more expensive as you get older and/ or if you have children (who all need to be insured separately). If you are employed, you must enter the public system and after 6-12 months, can decide to stay in it, even if you become a freelancer again. If you are married and your spouse is in the public scheme, their insurance covers you if you income is less than approx. €400 per month (after expenses and before tax). There are a number of other insurances that may be worth taking out. It’s worth noting that personal liability insurance (Haftpflichtversicherung) doesn’t cover any accidents that may happen at work, so you can also take out occupational liability insurance. Some people also thought that Rechtpflichtversicherung was a good idea. If you’re not charging VAT, you need to write “USt befreit nach §19 UStG”. If you don’t get paid, you can get a Mahnbescheid but only as a last resort (from www.mahngerichte.de/onlineverfahren). You pay a % of what you’re claiming but if you win the case, the school has to cover those costs. If you are claiming expenses for a home office, it needs to be separated from other rooms and is calculated based on the % of the floor space the office takes up. You also need to get your landlord’s permission for using the space as a home office. Otherwise, this could be grounds to evict you. You can offset bank charges as long as you have a separate account for business transactions (even if this is not set up as a ‘business’ account, but is simply a normal account used for this purpose). If you are away from home for more than 8 hours, you can claim €6, €12 or €24, depending on how long you are outside the home. If you travel for business, you can charge a flat rate per night (‘Businesspauschale’), even if you make your own sleeping arrangements. Travel costs: you cannot claim a monthly ticket in its entirety as a travel expense. You should keep a log, either in terms of the amount of miles or the cost of tickets, and calculate the ‘business’ portion accordingly.